Pro-Assad attacks, including bombing by Russian warplanes, killed 209 civilians in Syria in the first 10 days of 2018, according to the pro-opposition Syrian Network for Human Rights. from pro-Assad assaults on Idlib Province in northwest Syria and in the besieged East Ghouta area near Damascus. The organization said 48 children and 29 women are among the dead. 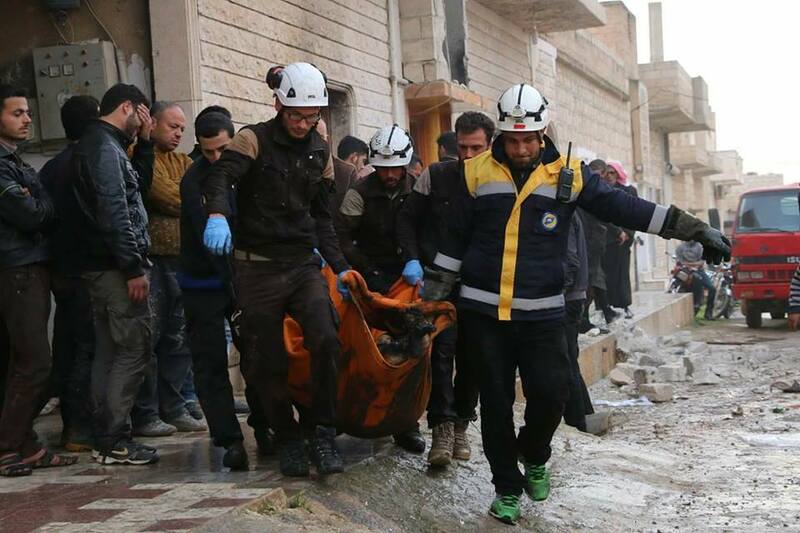 The SNHR added that 113 civilians, including 33 children and 25 women, were killed in Idlib Province from December 25 to January 10. UN human rights head Zeid Ra‘ad al-Hussein said on Wednesday that at least 85 civilians, including 21 women and 30 children, have been slain in East Ghouta since December 31. “Residential areas are being hit day and night by strikes from the ground and from the air, forcing civilians to hide in basements,” Hussein said. He added that, with the failure to distinguish between civilians and combatants, there are “concerns that war crimes may have been committed”. Hussein also said the Assad regime’s refusal to allow evacuation of seriously ill people from East Ghouta, with its almost 400,000 residents, also violated international humanitarian law. Both Idlib and East Ghouta are nominally Russian-backed de-escalation zones. However, the Assad regime has said that it will not enter meaningful negotiations until it has overrun the areas. On the pretext that attacks are against the hardline Islamist bloc Hayat Tahrir al-Sham, Russian warplanes have joined the assault in Idlib. Moscow has offered no explanation for its support of the pro-Assad offensive trying to seize East Ghouta. Rebels have regained 16 villages from pro-Assad forces in a counter-attack in southeastern Idlib. Pro-Assad outlets had proclaimed that their forces, after weeks of gains, were poised to take the Abu Duhur airbase, with the frontline only 2 km away. However, the counter-attack pushed back on the advance. Significantly, today’s response was by rebel factions — Ahrar al-Sham, Jaish Nasr, Jaish Izza, the Free Idlib Army, Faylaq al-Sham, Noureddin al-Zinki, and the Turkestan Islamic Party — rather than the hardline jihadist bloc Hayat Tahrir al-Sham, which had withdrawn from positions in recent days. Equally significant, those rebel forces have been seen with new Turkish-supplied arms and armored vehicles, indicating a possible pushback by Ankara against not only the Assad regime but also its Russian and Iranian allies. Local sources also report Turkish provision of ammunition, RPGs, mortars, Grad rockets and launchers, and tank shells. Video has been posted of captured regime troops. The Foreign Ministry has responded angrily to France’s expression of concern over the attacks on civilians, forcing up to 130,000 to flee, in Idlib Province. The Ministry said Paris had pursued the “adoption of allegations of the Jabhat al-Nusra terrorist organization”, and denied any targeting of hospitals and civilians. At least 10 medical facilities have been knocked out of service by pro-Assad bombardment. Germany has also called on the regime to desist. The head of the UN’s humanitarian operations, Mark Lowcock, gives a brief report on his visit to Homs. Lowcock is holding three days of meetings with regime officials in Damascus and Homs. When you are meeting your colleagues in Damascus, please ask them why aid is not reaching us? Are they too close to the regime or too scared of having their visas revoked? Can the UN honestly say they’ve done everything to prevent our children from dying from malnutrition-related diseases? PreviousAustria’s FM4: Is Trump Going to Make a Deal on Immigration?